In its current configuration, the 5,500 processor infrastructure can shrink design workload that could require up to of six years of single-processor computing time to the equivalent of a single day. The 5,500 processors are contained in over 700 separate multi-processor systems. The Ranches are also feature 30 high-availability file server clusters. The entire infrastructure encompasses 4.7 terabytes of random access memory and 250 Terabytes of data storage. Even with these massive resources, the Ranches run at 98 percent of their processing capacity on a 24-by-7-by-365 basis. Sun Compute Ranches are classic all-UltraSPARC all-Solaris, all-Sun Storage technical computing environments. A specialized software architecture running on top of the Solaris operating environment manages engineers' requests for Ranch services. This job management software distributes jobs among thousands of processors and manages licenses for over 125 third-party EDA applications and 100 Sun-internally-developed CAD tools. Engineers access Ranch resources either through Sun workstations, or, increasingly, via Sun Raytm Solaris terminals. The Sun Ray systems are proving especially popular among Sun engineers who recognize that they gain more by accessing the power of the pooled resources of the Ranch rather than executing jobs on their desktop. Ranch management has found it simpler and less costly to administer and provision Sun Ray desktop resources than full-blown workstations. SANTA CLARA, CALIF. - November 30, 2001 - Sun Microsystems, Inc. today opened the doors of a world-class facility to house its Sunnyvale, Calif., 2,800 processor-and-growing microprocessor design Compute Ranch. The new facility, and its sister sites in Austin, Texas and Chelmsford, Mass., is designed to speed development of new versions of the award-winning UltraSPARC processor by dedicating increasingly massive computing power to the task of designing and verifying complex, multi-Gigahertz, multi-100-million transistor processor designs. The ranches, which total 5,500 processors, serve Sun's 1,300-member processor design engineering team, and underscore Sun's commitment to keep the UltraSPARC processor ahead of competitors in the workstation/server technology space. Ed Zander, Sun's president and chief operating officer said: "The UltraSPARC processor is at the heart of our strategy. We're absolutely focused on making the people, technology and brick-and-mortar investments necessary to keep the UltraSPARC architecture well ahead of the competition. The Ranch is also an outstanding example of a Sun-on-Sun solution that can be applied to a broad spectrum of customers engaged in compute intensive engineering and research work." The Compute Ranch's main role is to perform the myriad calculations required to design new processors. To give some idea of the number crunching required for this kind of work, designing the UltraSPARC III processor required more than 400 Billion simulated cycles. At tape out for the UltraSPARC III processor--when designers send a chip "recipe" to the fab for production--data for chip consisted of 90,000 data files, occupying 23 Gigabytes of disk space. The new Ranch building is just one of the ways that Sun is demonstrating its commitment to developing advanced versions of the UltraSPARC processor product. The company's 1,300-member-and-growing UltraSPARC design team is the second largest processor engineering organization on the planet. The Austin, Chelmsford and Sunnyvale Compute Ranches plus Sun's investment in the latest processor design tools and techniques makes this engineering force one of the best equipped in the industry. 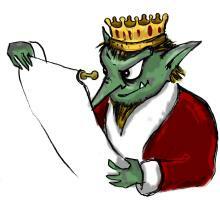 Gunnar the Goblin didn't understand high-tech standards, and he had the feeling that he might actually be on the wrong web site. He hoped that the illustrators at ACSL would hurry up and get the proper new Megabyte the Mouse graphic for Serial Attached SCSI drawn real soon. Throughout most of this year Sun's reputation for hardware reliability was plagued by random faults in some of their cache memory products. These problems caused a loss of confidence in Sun's core competence as a vendor of reliable trouble free servers. A recent Computerworld article with Sun's CEO Scott McNealy seems to draw a line under the problem, which Sun now blames on process or design problems in the high speed SRAM chips its was buying from IBM to use in its cache. Sun claims that data bits in the IBM supplied SRAM were being randomly flipped by alpha particles. It's about 20 years since I last heard about alpha particles affecting memory. In the late 1970's as chip makers prepared to solve the problems of designing the then state of the art 64K (65,536 bits) DRAM researchers at Intel Corp revealed that naturally occurring alpha particle radiation had enough energy to flip a bit in the new design geometry. Alpha particles occur naturally in air, and one source is granite rock. That's why if you live in a rocky area, you are advised to ensure that your ground floor rooms get plenty of ventilation, because the radioactive particles can be carried up through the floor. Anyway a small amount of naturally occurring radiation exists in most places, but unlike high energy gamma rays, the alpha particle radiation is relatively easy to shield. So semiconductor companies back in the 1970's were disturbed to find that their prototype RAM chips were being affected by this radiation. There were all kinds of scares at the time about what this would mean for the computer industry, and one suggested workaround was error correcting codes (ECC) memory, in which redundant logic was designed onto memory boards which could detect and fix single bit errors on the fly, and detect most double bit errors. ...Anyway, eventually chip makers found that the material which emitted alpha particles was actually occuring as a low level contaminent in the material which they used to coat and protect the chips. Changing those materials solved the problem as far as the electronics world was concerned for about 20 years. Sun's temporary fix to the problem in their cache was to use mirrored SRAM (ECC was not an option because the logic delay penalty cancels out the speed advantage of using SRAM in the cache). The real problem is probably a materials or process problem in the semiconductor manufacturing chain. Once identified, these problems can usually be fixed quite easily. This problem affected thousands of users, and one Sun customer wrote to tell us their company had replaced over 1000 UltraSPARC 2 400mhz cpus because of the ecache issue. About two decades ago, computer companies spent more time testing and qualifying the new components they used in new systems, and these kinds of problems would rarely have reached customers back in the 1980's. However increased competition has led to shorter delays between new technology becoming available, and being shipped in volume in user systems. Manufacturers now rely much more on computer simulations to get their basic chip integration tested, and don't spend so much time doing physical testing of their new systems. In the 1990's for example Intel shipped millions of flawed Pentium chips with a floating point division bug. However, unlike Sun's cache problem (which caused random faults), the Intel problem operated consistently and had a software workaround. Sad to say, we are going to see more of these kinds of problems occurring in future systems from all vendors. My guess is that Sun is now going to be ultra cautious about testing the new products it uses, and that may account for some of the delays in getting new generations of faster SPARC systems to market. But if they had employed a few more electronic engineers with gray hairs in the design department, the classic symptoms might have been identified a lot sooner and a lot of customers could have been spared sleepless nights. Memoryx stocks and distributes memory for Sun SPARC machines and for other workstations. SANTA CLARA, CA -- November 29, 2001 - Sun Microsystems, Inc. today submitted results of 230,049 operations per second (op/s) on the SPEC Java Business Benchmark 2000 (SPECjbb2000) using the Sun Enterprise 10000 server, aka Starfire, easily surpassing IBM's fully configured p690/HPC (Regatta) system performance of 169,794 op/s. Based on the benchmark configuration list prices, Sun's Starfire server achieved better price performance than IBM's p690/HPC with Sun's price performance of $8.95/op/s* versus IBM's $9.26/op/s. Additionally, Sun submitted a SPECjbb2000 result of 213,378 op/s using 400MHz CPUs, which again outperformed IBM's p690/HPC with 1300MHz CPUs. These results and the fact that IBM has only shown 16-way results on the Regatta p690 system brings into question whether or not the IBM p690 architecture and AIX operating system have the capacity to scale to more than 16 CPUs. Editor's comment:- I remember seeing some of the first generation AIX systems in the 1980's and being very surprised how slow they were at running applications relative to their touted fast clock speeds. It looks like Sun has continued maintaining their edge in the performance of their operating systems software.
. The HDC card is a high density, fully channelised, multiple protocol platform. It is dynamically configurable, providing up to 128 channels of SS7 MTP-2, SCTP, LAPB/D, Frame Relay, X.25 or HDLC in any combination per board. Four T1/E1 interfaces are provided through the QCX daughter card, and the HDC also has two 10/100 BaseT Ethernet ports available for connection to the Internet and other IP networks. The HDC card provides a scalable solution for telco, industrial and other high-reliability applications (from PCs to enterprise servers), as the H.110 bus allows for the cross connection of multiple boards. Simultaneously, the high port density of the HDC card reduces slot space, resulting in a cost-effective solution. Four slots in a chassis result in 512 channels of processing. HDC has hot swap and hot plug capabilities and can be removed from service without interrupting the higher layers and applications in process. Powerful on-board processors perform many transactions per second and provide efficient bandwidth management, freeing the host CPU and maximising its processing power for higher layers and applications. Adax claims the HDC achieves this performance without compromising the reliability that the telecommunications market requires. Reading, England  29 November 2001  Adax, the industry leader in high performance wide area communications and signaling infrastructure, has completed its line-up of convergence technologies with the introduction of 10/100 BaseT Ethernet capabilities for its HDC multiple protocol controller. Adding the Ethernet ports to the HDC provides direct connectivity to the Internet and other IP networks, enabling Adax to offer the complete solution for the convergence of IP with PSTN networks. The new boards serve as the signaling interface for convergence networks, softswitches and next generation network gateways, says Adax, whose products lie at the heart of telecoms systems from giants such as Alcatel, Ericsson, Lucent and Nortel. "With the addition of Ethernet capabilities to our ATM Plus controllers last month, and now the HDC cards, this completes our convergence technology set," said Robin Kent, Director of European operations at Adax. "Together with Adax' SCTP/T software for high reliability IP signaling, our convergence hardware meets the signaling challenges of VoIP and multimedia wireless networks."
. "Enterprises looking at cluster failover solutions to improve high availability (HA) face the complexity of configuring their cluster hardware and tuning their clustering software, often via custom scripts," said Jean Bozman, Research Director at IDC's Enterprise Server Solutions group. "Making applications 'cluster-aware' can become an expensive undertaking that requires advanced IT skills. By providing a triple-redundant fault-tolerant appliance server, Resilience is making it easier and less expensive for customers to meet their high-availability requirements for demanding applications, and is well positioned for growth in this new market segment." Sunnyvale, CA  November 27, 2001  Resilience Corporation today announced the introduction of a new line of appliances specifically focused on two segments: security and storage. These Continuous Availability appliances will provide the ultimate in ease-of-use and rapid deployment for applications that require zero downtime. With its patented Triple Modular Redundant (TMR) architecture, Resilience's Continuous Availability servers provide full protection against hardware failure. This technology has been validated by a long list of customers including AT&T, Cisco Systems, Susquehanna Investments Group, The Boeing Company, Mack Trucks, Inc. and Sears, Roebuck and Co. These companies rely on Resilience servers to keep key applications running non-stop. Resilience is now applying this proven technology to the appliance market by integrating best-of-breed third-party applications to offer pre-installed, ready to deploy, easy to maintain appliances for the enterprise. High Availability appliance implementation currently requires expensive and resource-intensive cluster failover approaches. Resilience eliminates this complexity by providing plug-and-play implementation and easy maintenance with 60-second hot-swappable modular components  all while keeping business-critical applications running continuously. Editor's comments:- I haven't looked at Resilience's patent for TMR, but some aspects of this press release are a little bit misleading, if they are taken to mean that Resilience invented TMR . I remember studying TMR, as an EE student, in the mid 1970's. As I recall, the TMR concept was originally developed by the Jet Propulsion Labs at NASA for use in their deep space probes. Also in the early 1990's ft SPARC manufacturer IMP, acquired by Sun in 1994, was also delivering products using this kind of technology. Both examples (and there are many others) were established well before Resilience was actually incorporated. I don't doubt that Resilience does have some patents related to their specific product implementation, but laying claim to the entire field of prior art in TMR deserves some balanced comment. If any of the relevant vendors want to expand or clarify this point to our readers, they know how to contact me. "Wipro has been a dependable partner in the six year development of UWIN and now expanding its reach worldwide through its online sales and support services." Says David Korn (AT&T) regarding his association with Wipro. To meet the changing requirements from customers, Wipro UWIN is internationalized and can work on any language version of Windows. Says Sandy Strain of Integralis, "I do lot of work with PC's and also various flavors of UNIX - Wipro UWIN is ideal for that. It is a very good product. Should be the standard environment for Windows". November 22, 2001 - Wipro Technologies' product Wipro UWIN reached a milestone today when it reached a client base of 600 satisfied users including Nokia, Ericsson, Cisco, Hewlett Packard and Intel. Wipro UWIN - a powerful UNIX-Linux-Windows Migration/Integration Toolkit is one of the four technologies in the world that provides complete Unix-NT interoperability and gives users the pleasure of working on both UNIX and Windows without having to reboot the system. Wipro UWIN aptly demonstrates Wipro's competence in the areas of Unix and Windows kernel. Wipro UWIN is a comprehensive set of UNIX command shells and utilities providing users their familiar UNIX environment on a Windows platform. This is great news for Unix lovers as they can remotely access Windows server and work from home on their favorite Unix platform. For Corporate users, Wipro UWIN has resulted in huge savings in terms of time and money. A case in point is that of one of the largest WAP service providers in the world. One of their most popular WAP product's code was written in Unix. To meet client requirements, they needed to replicate the product on Windows. Instead of initiating a new project, they logged onto www.wipro.com/uwin. Within no time they had downloaded Wipro UWIN and within days the product was recompiled on Windows without changing the source code, all at a fraction of the cost of developing the product from scratch. UWIN was originally conceived by David Korn (of Korn Shell fame) at AT&T Research Labs, with an objective to bridge the gap between UNIX and Windows by providing user and development environment, and to provide an environment for smooth migration of UNIX applications onto Windows. Korn approached Wipro for a joint R&D effort with AT&T Research Labs. Wipro took the initiative of converting this research effort into a product. Today AT&T has licensed Wipro to Productize and Commercialize the UWIN product.
. The SunTone Certification and Branding Program is a collaborative industry effort, led by Sun Microsystems, Inc., to promote 7-by-24 service and reliability as a norm for consumer and business Internet-based services. Under the SunTone program, service providers, independent software vendors and integrators have endured a rigorous review process which examines infrastructure, operational practices, hardware, software, and overall service delivery to help ensure that the services or products provided by a company meet the SunTone program's best practices and high quality standards. Certification under the SunTone program is designed to give customers the confidence that each aspect of the company's operations and infrastructure has been evaluated and judged to be reliable and of high quality based on industry-derived standards. Launched in May 1999, The SunTone program currently has more than 1500 applicants for certification and more than 200 SunTone Certified solutions available to meet a variety of business needs. SANTA CLARA, Calif. - Nov. 21, 2001 - Despite the slowdown in economies, or possibly because of it, the SunTone Certification and Branding Program, led by Sun Microsystems, Inc., is gaining significant ground in all key European markets. The list of companies across Europe joining the SunTone Certified ranks and delivering high-quality services and applications, grows daily. European service providers and independent software vendors (ISVs) are underscoring their commitment to quality web services by putting their services and applications to the test for SunTone certification. Editor's comments:- You can't argue with the proposition that reliable internet services are a good thing, like Motherhood, Apple Pie (or should it be renamed Sun Pie?) and computers that don't need to have the reset button readily accessible by your keyboard. But Sun's got so many marketing programs that they lose all value. If you missed my spoof article about the SunBlest marketing program in the summer, here's another chance to see it. Editor's comments:- last month Titan Corporation announced that the U.S. Postal Service selected Titan to provide electron beam systems and services to sanitize mail to eliminate the threat of anthrax contamination. The company makes an interesting range of products including reflective memory, ADC's and military servers. But their web site is a bit cryptic in some places and it's hard to find all their products. In the competitive arena, the published numbers for the UltraSPARC III Cu 1050 processor place it ahead of the Intel Itanium and Hewlett Packard PA RISC. Furthermore, the UltraSPARC III Cu 1050 dissipates only 75 sustained, peak watts of power-an increasingly important specification that contributes to the ability to pack more processors in a system without the need for exotic and expensive cooling as well as overall energy efficiency. At this point, it is not clear how the UltraSPARC III Cu 1050 processor stacks up against the dual-core IBM POWER4. Critics have pointed out that the scores claimed by IBM are achieved by executing test code only one POWER4 core on a eight-core module, accessing cache memory that would otherwise be used by all eight cores on the module. Idling the other seven cores to achieve the fastest possible laboratory benchmarks is clearly an unrealistic operating condition that would not occur in the real-world and generates results that do not scale beyond the one processor executing code on the module. SANTA CLARA, CA - November 19, 2001 - Sun Microsystems, Inc. today disclosed SPECint (integer) and SPECfp (floating point) benchmark numbers for a new version of the UltraSPARC III microprocessor that firmly positions it at the forefront of workstation/server processor performance. The UltraSPARC III Cu 1050 processor, set for availability for Sun workstation products in early 2002, features a 1.05 GHz clock speed, a SPECint mark of 610 and a SPECfp mark of 827. These respective 32% and 72% performance increases are particularly impressive when compared to the new processor's overall 17% clock speed gain. These outsized performance gains result from improved manufacturing techniques, enhanced internal buffer sizes and management, and more efficient object code generated by a new version of the Forte compiler. Munich/Germany - Nov 19, 2001 - Fujitsu Siemens Computers has extended its Business Critical Computing capability with the announcement of Active Resource Management software (ARMTechTM) and an Enhanced Server Capacity on Demand (ESCoD) facility for its Solaris/SPARC-based PRIMEPOWER servers.